While mall-ing (yes, that's now a word to describe activities related to dropping by malls for whatever purpose you have intended to), particularly at Festival Mall in Alabang, I stumbled upon another good find; this time in terms of a cold and refreshing drink after a tiring arcade basketball shooting game nearby (close to the tech and gadgets area of this mall). 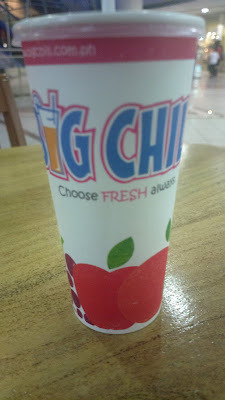 The product is called Big Chill and it comes in various fresh fruit shake flavors including yogurt and protein mixes. I opted for the healthy fruits with yogurt. For more details on what Big Chill offers, you may refer to their website www.bigchill.com.ph or their Facebook page www.facebook.com/mybigchill for the complete menu, branches, and other information. Big Chill! it looks really cool and refreshing.